You would think with as many trivia shows as I have under my belt, I would just be a creature of habit and not have any issues week after week. Well, you'd be wrong. The last few weeks, I've handed over the mic to Jamie so she could get some experience flying solo before her big debut at her own gig over on Magnolia (spoiler alert, she killed it, and you should go check out her show a the Lazy Moose Saloon). Between Alex from Shannon Brewing Company handing out free beer and prizes, collecting donations for the PubGuys Hurricane Harvey relief fund (we've raised over $1300 so far! ), and being back on the mic after a few weeks, the night went on almost as long as this sentence. 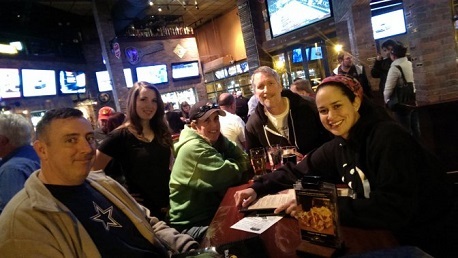 In the end, it was another fantastic night, and in less than 30 minutes, we managed to raise more money than our rivals across town at WOB FTW. Though admittedly, there's no need for bragging rights as we are honored to raise every dollar we can to help those impacted by Hurricane Harvey. Congratulations to our winners, the Mouseaholics and Punching Miss Daisy on their game 1 & 2 victories, respectively. Now, for your Scavenger Hunt bonus point.... tell me the maiden name of the woman that shares her first name with the Atlantic hurricane to cap out at 882mb in strength. what's the difference between a joke and 3 dicks?